This comprehensive visual dictionary is the perfect Star Wars(TM) book for getting to know the galaxy far, far away. Packed with more than 1,500 stunning images, it showcases major and minor characters (such as Princess Leia and Luke Skywalker), creatures, vehicles, weapons, props, and items of tech in unparalleled detail. Beautiful photography and engaging text written by Star Wars experts examines the finer points of Padmé Amidala's costumes, displays Boba Fett's array of weaponry, studies Darth Vader's armor, and reveals the lesser-known background stories to many of the characters. Find out who Poe Dameron's idol is, discover the tech behind BB-8's rolling motion, and much, much more! Fully updated to include the latest installments of the Skywalker saga--Star Wars The Force Awakens and Star Wars The Last Jedi--this invaluable reference guide incorporates all the latest stories and characters. 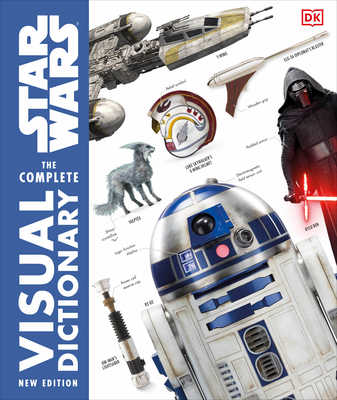 The definitive companion to the Star Wars movies, Star Wars The Complete Visual Dictionary is a must-buy for the beginner and the die-hard Star Wars fan alike. Pablo Hidalgo has been writing professionally about Star Wars since 1995. In 2000, he joined Lucasfilm to become a full-time Star Wars authority, first as a StarWars.com writer, and now as a creative executive in story development. He has written or co-written several authoritative Star Wars reference books, including Star Wars: Year by Year and Star Wars: The Essential Reader's Companion, as well as guidebooks to other brands such as Hasbro's G.I. Joe and Transformers. He lives in San Francisco. Dr. David West Reynolds earned his PhD in archeology at the University of Michigan. A lecturer, veteran of field expeditions on three continents, and author of scientific archeological publications, Reynolds has also written five Star Wars books, including DK's best-selling Star Wars: Incredible Cross-sections and Star Wars: Complete Vehicles. James Luceno is the best-selling author of Dark Lord: The Rise of Darth Vader and three Star Wars: The New Jedi Order novels, among many others. Ryder Windham is the author of more than 60 Star Wars titles, including Star Wars Blueprints: The Ultimate Collection and the New York Times-bestseller Star Wars: The Ultimate Visual Guide. An occasional freelance cartoonist and storyboard artist, he is also an instructor and the Certificate Program Advisor for Comics and Sequential Art at Rhode Island School of Design Continuing Education. Jason Fry is the author of The Jupiter Pirates young-adult space-fantasy series and has written or co-written more than 30 novels, short stories, and other works set in the galaxy far, far away, including The Essential Atlas and the Servants of the Empire quartet. He lives in Brooklyn, New York, with his wife, son and about a metric ton of Star Wars stuff.